Ever wonder what to do with all that art work? Are you looking for a class project to send home to parents? Create your own web flip books. This website has an awesomeFREE tool for publishing custom classroom books. a) Scan in your student's artwork, assignments, stories, etc. and then save them as PDF's. b) Have your students create their artwork in a program like Paint. Copy and Paste the work into a Word document. You can add captions here, just make sure you use large type font. Then save that Word document as a PDF. Remember where you save the files! Step 2: Go to theyoublisherwebsite and follow the steps. a) Create an account with username and password - giving them a current email address. b) Check your email for a welcome letter that will contain a confirmation code. Copy the confirmation code. c) Log into theyoublishersite, paste in that confirmation code. You are ready to go! a) Click "Add New Publication"
b) Click "Browse" and locate your saved file. d)Youblisherwill prompt you to title your doc, select language, etc. e) Youblisherwill do the rest. It will say "processing." You can log in, and click "view publications", "edit," or "delete" any time. Once you publish a book, you can not go back and add more pages. You can, however, edit the Title. You can delete or add as many as you like. When viewing the document, you'll see icons in the right hand corner, that allow you to zoom in, email, save as a PDF, and flip pages (left and right arrows). Highlight the URL at the top of the page, while you are viewing your publication. Copy that URL and you can share it with whomever you wish to view the document. 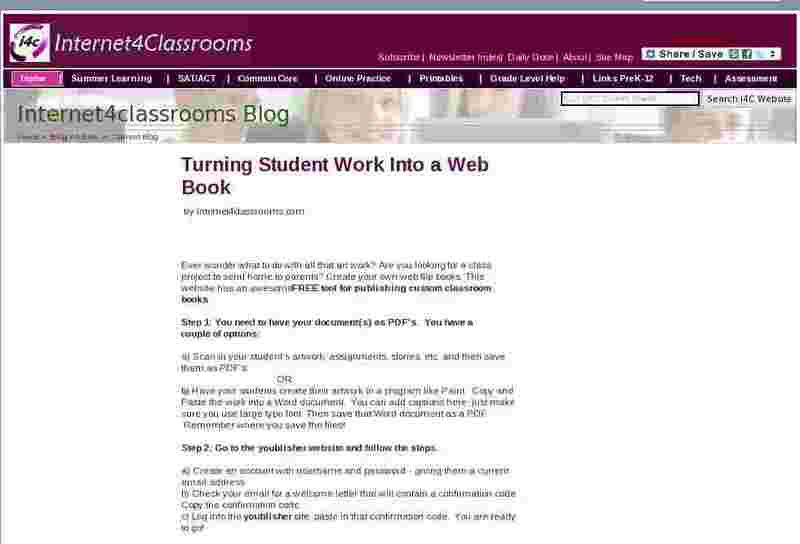 If you have a classroom webpage, you can also embed your publication links. It's a great - paperless - way to showcase student work. It's also a wonderful way to get children motivated to create. So get publishing!